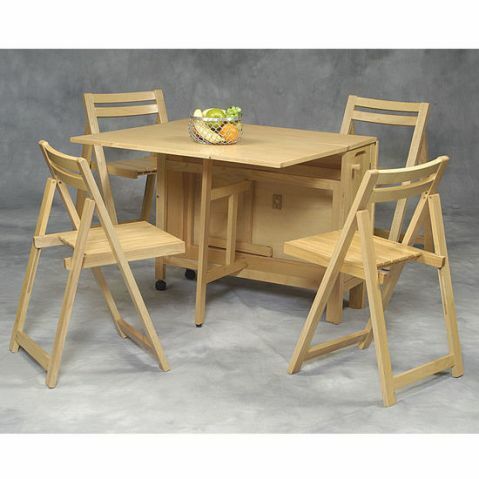 If you are looking for purchasing dining sets online then kitchensource.com is the place to go. Kitchensource.com is the online pioneer in retailing dining sets since 1996. Kitchensource.com is a professional place since they have a team with members of about ten years and principals with 45 years experience in the field of home trade. When you buy a dining set from kitchensource.com, you get the benefit of free shipping, easy returns without restock fees. In case you are looking for more information before selecting your dining set, the kitchensource.com family include specialists who are ready to answer your questions through the toll free number with live support which is available Monday through Friday from 9am to 6pm EST. You can also reach the kitchensource.com family through their email or just mail their Connecticut branch. 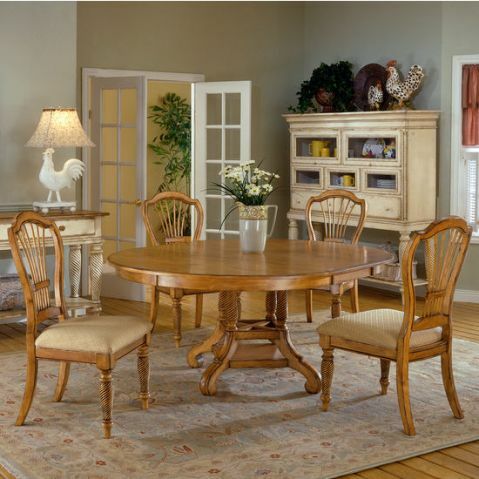 Fans of rustic style will fall in love with this Wilshire Round/Oval Table Dining Set. Being made of antique pine, this dining set combines beautifully with a country or classic themed dining room. This dining set provides a nice cozy feeling and needs an accessory as minimal as a vase with daisies to look perfect with simplicity. 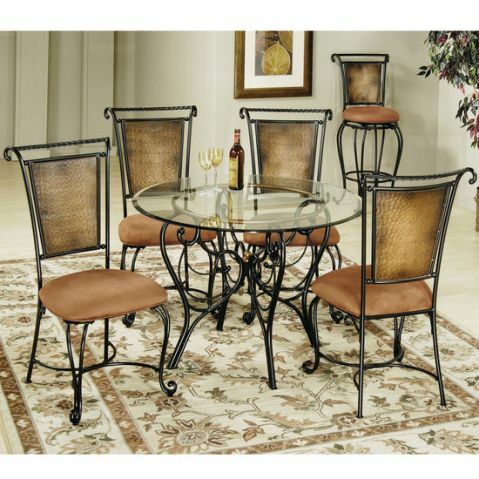 This Linon 5-Piece Spacesaver Dining Set really stands to its name by being a sensational set of convertible furniture. The set consists of four foldable chairs which can snuggly fit into the collapsible table and be stored away in no time. This astonishing dining set is perfect for small areas and if you think the table would be too heavy to carry around, put your worries away as this dining table is fitted with smart wheels. All the elegance of a classic dining set can be seen in this Hillsdale Furniture – Milan 5-Piece Dining Set. The chairs which are adorned with delicately curved legs make a statement without taking any space at all. The glass table top also raises the atheistic value of the dining set by skillfully reflecting some of the room’s elements while letting the light path through. 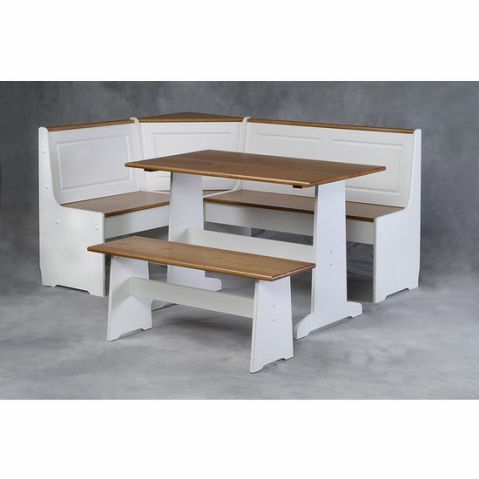 If you have a family that enjoys gathering for delicious meals and sharing engaging conversations in the kitchen then this Linon – White Corner Nook Set would be of great benefit. Room corners usually stand neglected and unnecessary in decoration but this dining set might make the best use of corner space and provide you with more area to decorate, furnish or just breath. 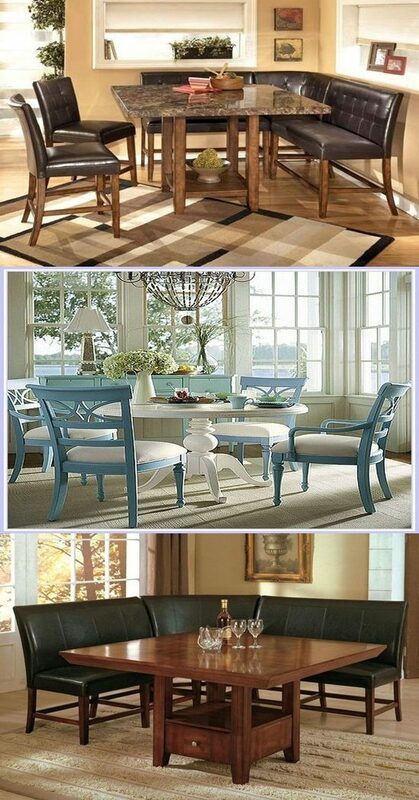 Using contrasting colors to accessorize around this dining set will highlight your taste significantly.